* This liturgy was created by Rev. Dr. Katie Day and with the presence and singing of rabbi Liz Bolton and the choir from Mishkan Shalom Synagogue. 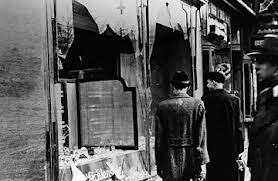 Kristallnacht , also referred to as the Night of Broken Glass, was a pogrom or series of coordinated attacks against Jews throughout Nazi Germany and parts of Austria on 9–10 November 1938, carried out by SA paramilitary and civilians. German authorities looked on without intervening. 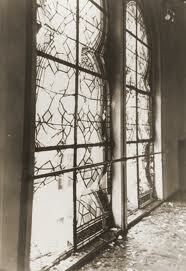 The attacks left the streets covered with broken glass from the windows of Jewish-owned stores, buildings, and synagogues. At least 91 Jews were killed in the attacks, and a further 30,000 arrested and incarcerated in concentration camps. 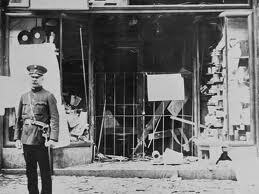 Jewish homes, hospitals, and schools were ransacked, as the attackers demolished buildings with sledgehammers. 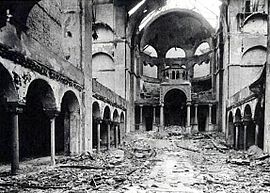 Over 1,000 synagogues were burned (95 in Vienna alone), and over 7,000 Jewish businesses destroyed or damaged. We gather this day as children of Abraham and Sarah. which covered the streets of Germany. We gather to remember and to mourn the hate that was unleashed on the people of God. Give us strength this day. as waters rage and foam around us. And we are your beloved people. and shortly before his execution on April 9, 1945. —it can be full of meaning and activity…..
-It is in silence that we open our hearts and spirits in prayer. –in communicates louder than speech our own indifference. We come before you in humility. yet we are more absorbed with skepticism than with awe. but we continue to focus on our differences and not on our commonalities. We have forgotten who we are—your people, created and called by you. We have lost our voices and too often we are silent when we see our sisters and brothers suffering under injustices you abhor. And give us the grace to be merciful to one another and to ourselves. -even the shattered body of Jesus. Psalm 119:1-8 The refrain is introduced by the choir, repeated by all. The choir sings the verses of the psalm. The assembly stands to welcome the gospel. The assembly stands to proclaim the word of God in song. The table of bread and wine is now ready. It is the table of company with Jesus and the beloved community. In which Jesus was present and the Creator continues to work. Not because you must, but because you may. The God of mercy invites us to meet Gods very self here. Let us give thanks to God Most High. And sustain them by your power. And to create peace and justice among your people. And courageous witnesses to reflect your truth. At this table we are thankful for Jesus Christ whose life and death embodied the sacrifice of love which brings light in the darkness of the world—in his brokenness, shattered hope is restored. And in deep longing for the return of peace. Send us out to be his bread in the world. Gathered into one by the Holy Spirit, let us pray as Jesus taught us. You have made us one with all your people on heaven and on earth. Hold on fiercely to what is good. But don’t get pulled into it either. To serve God and to serve God’s people. Then all hell broke loose…. Fires raged and many caught in the crossfire were killed. And who was to clean up this mess? 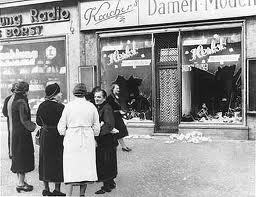 they learned that while the world might condemn their pogroms (attacks) against the Jews, it would not intervene. Carry out violence against Jews…. 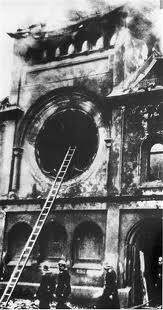 After Kristallnacht, the stage was set for the Final Solution…when it was over, 6 million Jews would be dead..
III. This begs the question for us: Where was the Church? C. How could Christians have so betrayed their Jewish neighbors? How could the Church—especially the Confessing Church—forgotten who they were? How could Church have betrayed themselves so deeply…. Which is most central teaching of tradition? What is core to who we are as people of God? -if we should take our cat to the vet…. And in that, we can forget who we are. In our love of one another.